Flat Ash Splint - 1" x 3/64"
Flat ash is machine cut from select ash wood. Each strand is 6’ long . 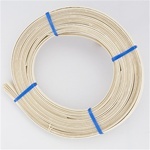 Each coil contains 10 pieces. The ash can be used for seat weaving and basketry. We recommend the booklet Splint Seats for Chairs for seat weaving instructions. 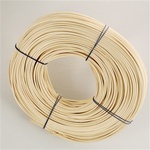 Flat Reed and Flat Oval Reed is rattan splint cut by machine from the larger diameter rattan poles. 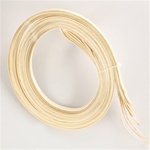 Round Reeds are the core of rattan. They are machine propelled through dies to obtain the desired diameter. 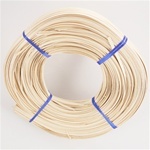 Round Reed are very pliable and are packed in coils of approximately 1 lb. 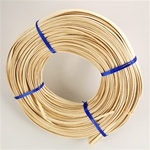 Round Reed is ideal for basket weaving and repairing wicker and reed furniture.